The Rocket occupies the tail end of that history, being introduced sometime in the 1950s,1 and selling for as much as $70 — much less as the years passed. I own three Rockets (one was given to me), using them regularly for typing. 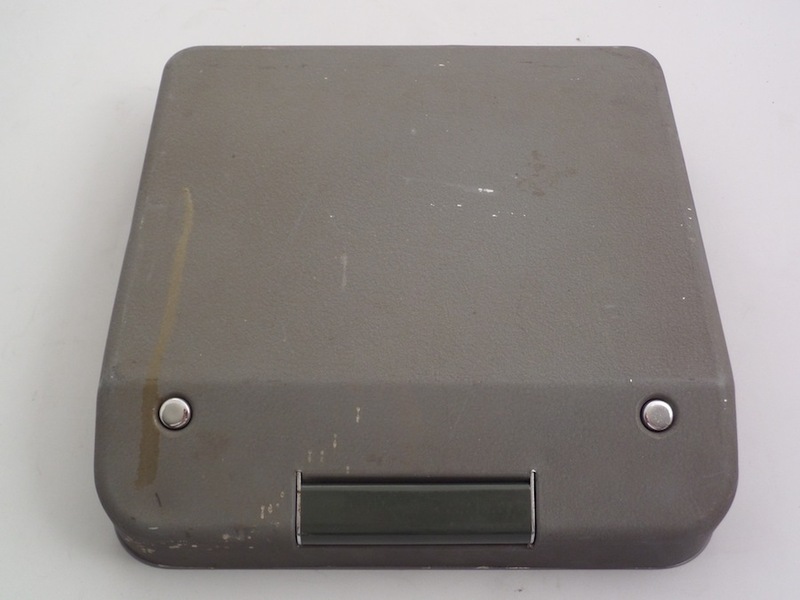 The serial number on the machine pictured in this post is 5415578, which according to the Typewriter Database dates the machine to 1954. My collection of Hermes-designed machines also includes the Montana Luxe and the Montana Viking. You can read about the Luxe here. 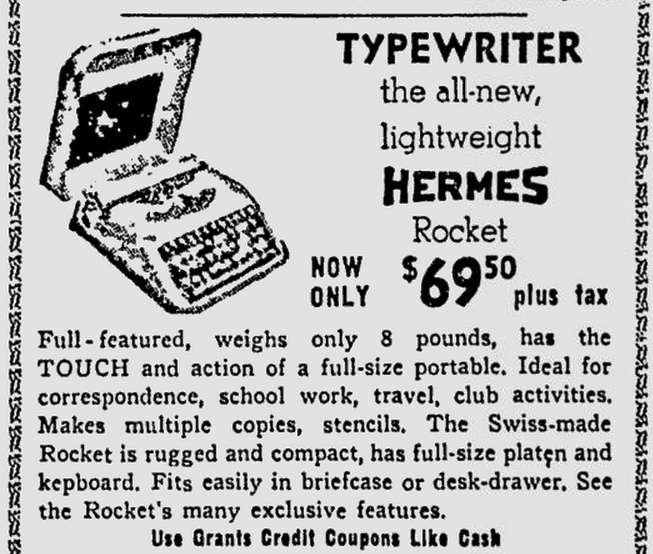 The Hermes Rocket, often advertised as the world’s lightest portable, was offered at ever-decreasing prices over the years. The Pittsburgh Press – Dec 16, 1955. 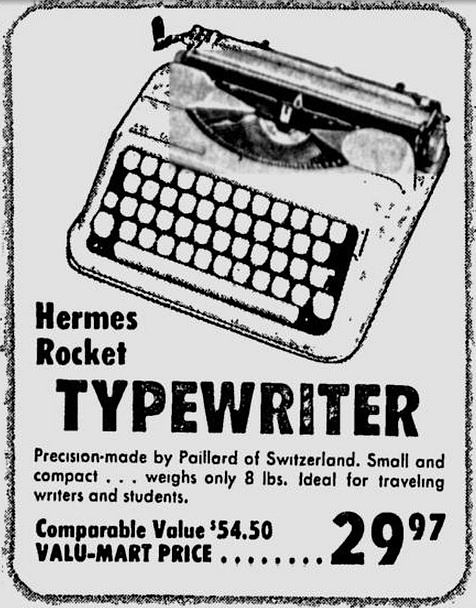 Beaver Valley Times – Nov 12, 1959. 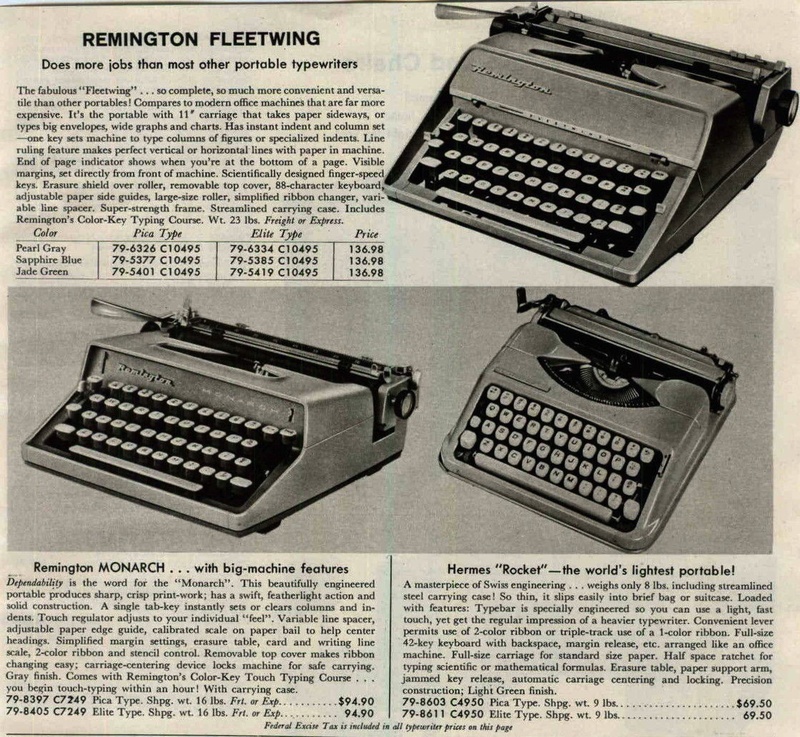 The Hermes Rocket appears in this 1963 catalog alongside the Remington Fleetwing and the Monarch. Eugene Register-Guard – Apr 23, 1964. Spokane Daily Chronicle – Dec 12, 1966. Spokane Daily Chronicle – May 25, 1967. Nicely written typecast. Easy to read too. What resolution was it scanned at? Yep. My little green Rocket usually wins out over the Sky-Riter when I’m packing for an RV excursion. A simple 300 DPI in the color image mode, with only a touch of sharpening. interesting to see the price drops – this was not the case in Switzerland, where it maintained a more or less equal level. I have an Hermès Rocket made in 1949. An estimate of what to sell this for, if you please. As well as where to sell. Man, I wish I could get a “@” for my Hermes Baby. I recently found in mint condition a Hermes Rocket for $31. 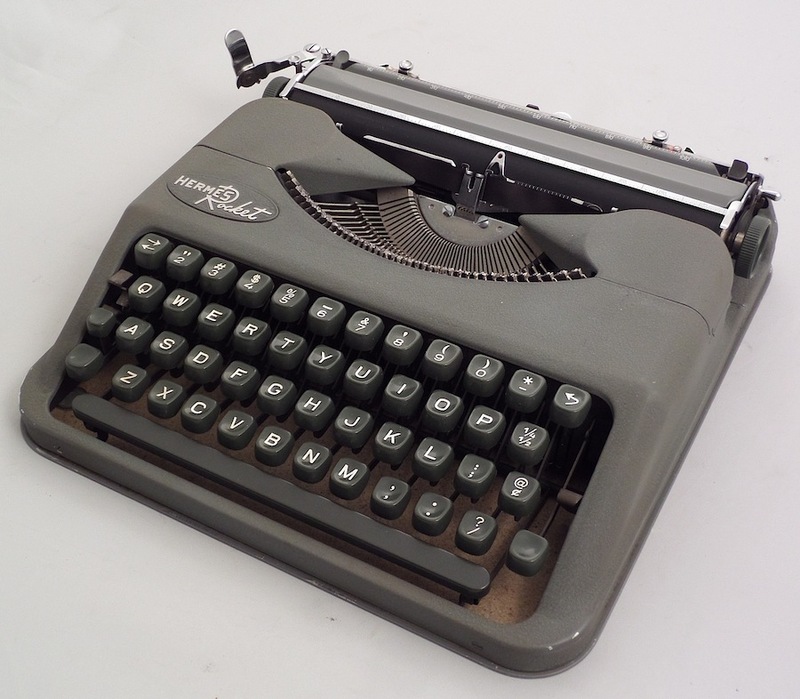 I am not certain what year it was made, but I did check the typewriter database and a serial number close to mine dates this machine between 1968-1970. 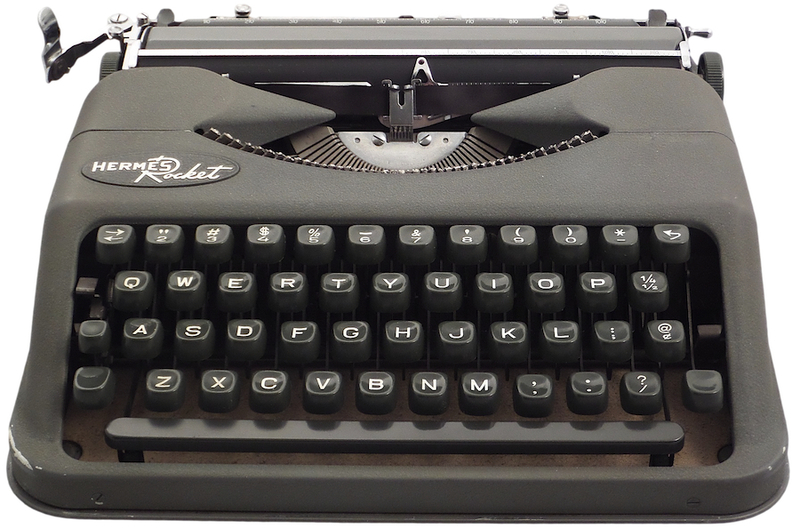 Types beautifully except it has a Hungarian or Slovic keyboard but I can still use it for what I type. Not a scratch, dent or chipped paint. I put a new ribbon in it and it is almost like brand new. The person who owned it took excellent care of it. 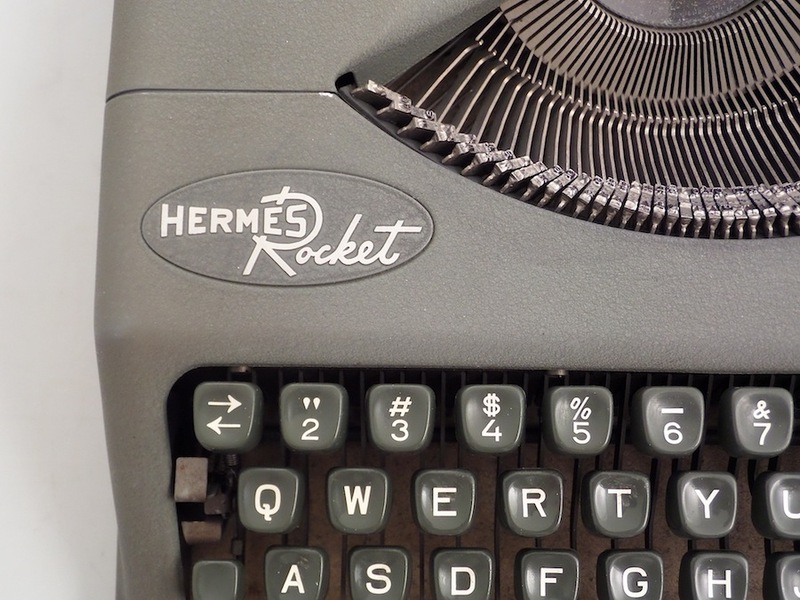 I just bought a Hermes Rocket with SCRIPT type. I can’t wait to use it. 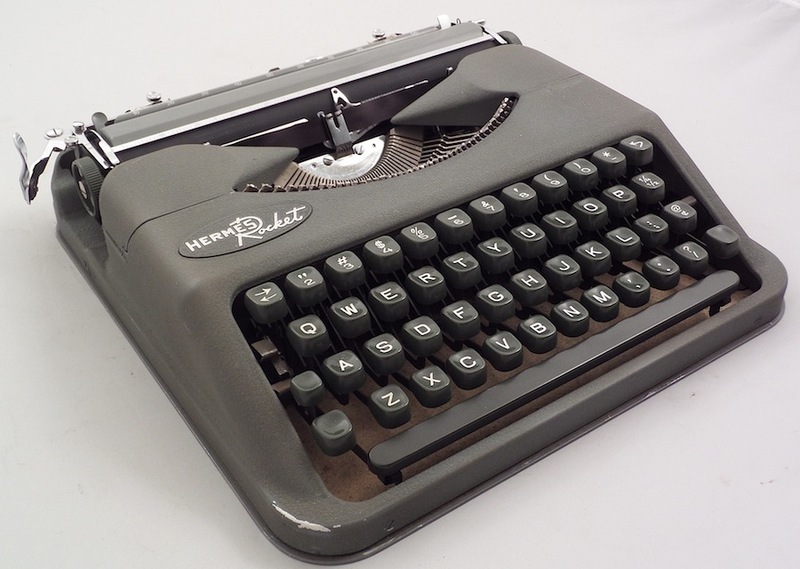 It needs to be serviced but luckily I have a great guy who also serviced my Hermes 3000 too. 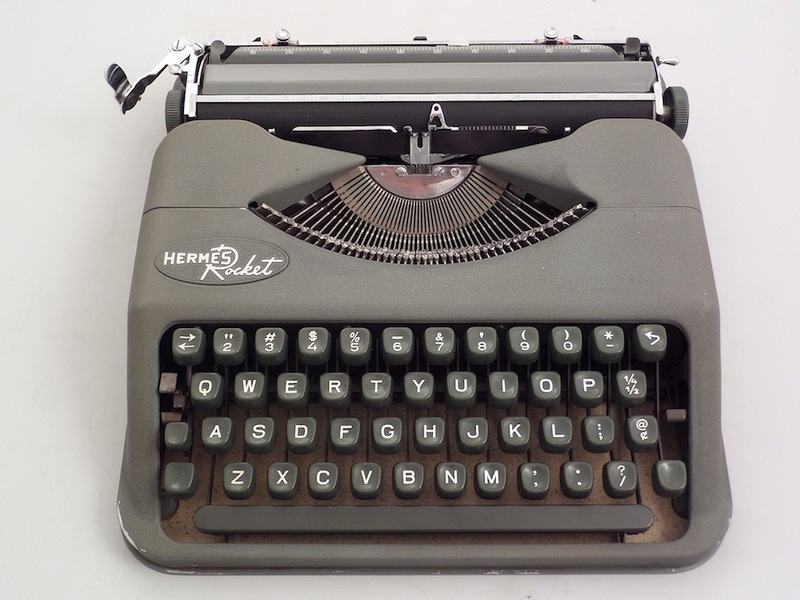 I just love the Hermes typewriters! Would you mind telling me how much you paid? I am trying to get a fair price. That’s a difficult question. I paid $50 for mine, but needed a new platen: another $75. I now have a great typer, one of my favorites, but it wasn’t the $50 deal I thought I was getting. Happy nonetheless. Interesting that the price continued to drop. I wonder why? In today’s world of technological advances, lightweight is a reason to increase the price. 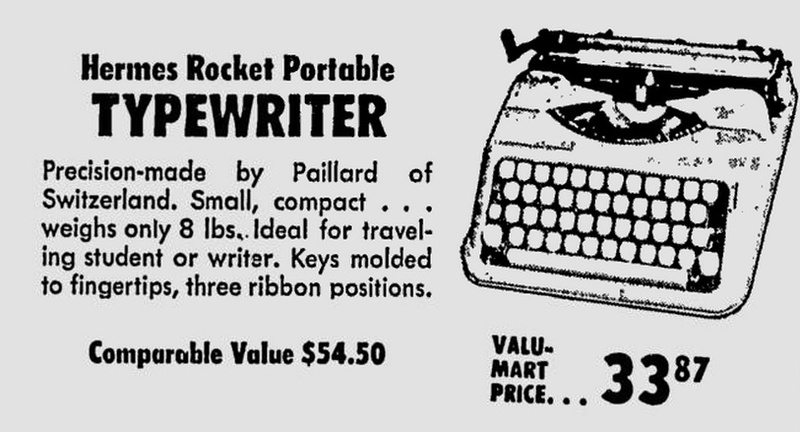 If I were an aspiring journalist or writer in 1960, I would want something as light and portable as I could get. It’s rather curious that despite their popularity the price dropped. I imagine that economies of scale led to a progressive decrease in its price. This portable was not remarkably changed over the years, stabilizing the cost of its production. New products incur new expenses; old products, few. Interesting point. I suppose these days you rarely see a price drop and something unless sales are down. I cannot imagine a company like Apple reducing its price even if it’s cost went down. That’s strange, because the price of silicon chips generally plummets after the first couple of years of production, especially if they’re popular. The majority of the price of those goes to paying off the design costs. Apple probably doesn’t price according to their costs, or they bring out new models before the component price has fallen much. 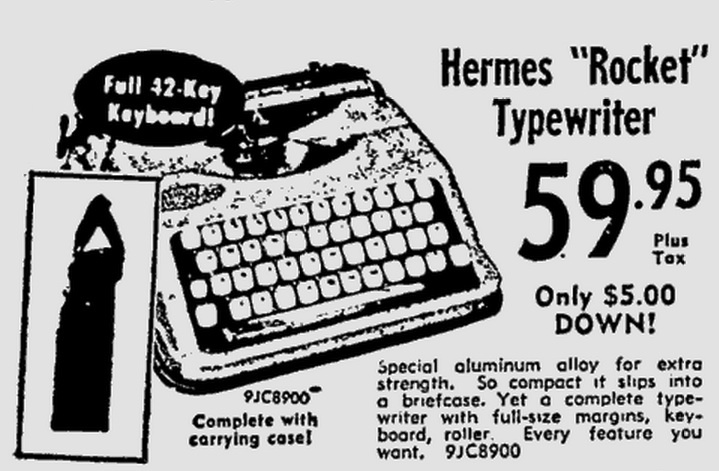 I have a Hermes Baby I like typing on from time to time. Such a well designed machine- nothing like Swiss precision. I really enjoyed your story, All That Is Enough, on your typecast btw! We just bought a Hermes Rocket (Sea-foam Green) from Salvation Army for $9.99! 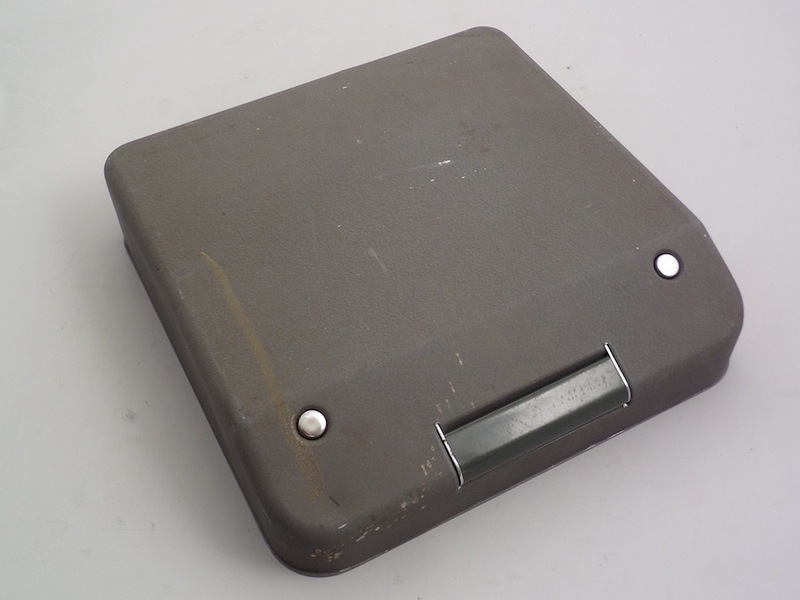 According to the serial # it looks like it’s from 1961, and it’s in beautiful shape, case and all! Hopefully we can find someone to clean it up, although it seems to be working fine. 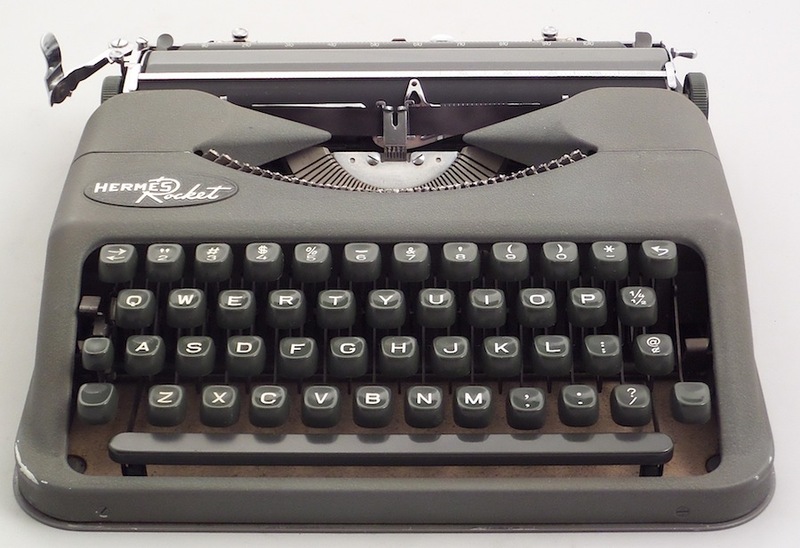 Feels nice to get a real typewriter under my fingers! What a good deal. 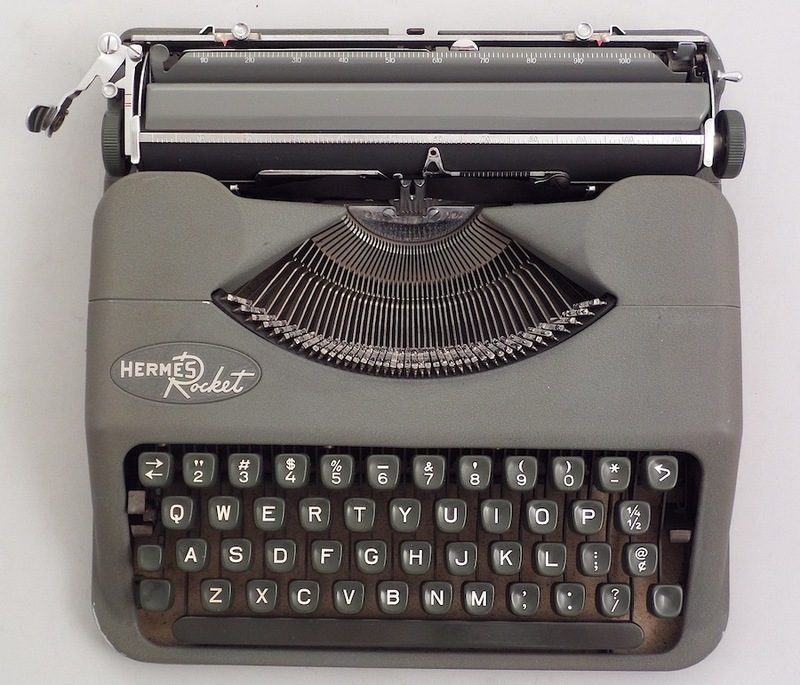 Richard Polt offers a list of typewriter repair shops here: http://site.xavier.edu/polt/typewriters/tw-repair.html. I replaced the platen on mine, and it is a fine typer. Thank you! There’s one about 45 minutes from us; I can pair it up with a trip to some of their local thrift stores. Love my Rocket. I got it from my father, and used it like a war correspondent/poet/ since. It was amazing when I googled my dad’s college work and saw that it was the same exact type as the Rocket, even with the small nicks. I finally had it cleaned and tuned this week, maybe for the first time.